Garden Works has provided the Torrance area with tree trimming services for several years now. Find out why Torrance prefers Garden Works when it comes to their tree trimming needs. Garden Works provides Extraordinary tree care for each and every customer. We are well versed with difficult and dangerous trees but also offer competitive service for small trees. At Garden Works we utilize our experience and team work for every job no matter the size. In many cases our crew are required to climb the trees in order to bring them down safely. We understand how to take care of your trees when it comes to trimming and pruning. Torrance is our home too and we agree, the trees do look better trimmed. All Tree Trimming can be very dangerous business if you don't know what you are doing. It may take one wrong move to damage your property or cause injury. Tree Trimming work that is done in Torrance is assessed and we take into careful consideration all the risk. 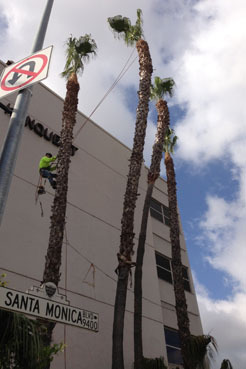 Contact us at 310-930-5353 if you are wanting to set up a tree trimming appointment. Looking for other Landscape Services? If you are in need of assistance outside Los Angeles we also service local cities.